If the victims of Bernard Madoff were looking for catharsis in the court of U.S. District Judge Denny Chin, they got nothing close to it. Several of them had gathered in the large, packed courtroom in Lower Manhattan for Madoff’s hearing Thursday morning, but Chin issued instructions that victims could speak only if they wanted to object to Madoff’s pleading guilty to 11 counts of fraud. The first victim to speak, George Nierenberg, was so angry and agitated that he could barely stay at the lectern; he got scarcely 45 seconds into his feelings before the judge told him to return to his seat, reminding the others of his instructions. Only two more witnesses chose to speak afterward, even though many more were present in the courtroom. Madoff sat still as a statue, his eyes downcast. The dry monotony of the proceedings made many eyes glaze over. Only Bernard Madoff’s nasal explanation of how he pulled off his scam provided drama. Looking down at his statement and avoiding eye contact with any of the victims, the most hated man in America said he was “deeply sorry and ashamed” for what he had done. Occasionally tripping over his words, he seemed nevertheless to be in control of his emotions. In his Queens accent, Madoff said he was grateful for the chance to address the court. “As the years went by, I realized my risk and this day would inevitably come,” he said. “I cannot adequately express how sorry I am for my crimes.” Madoff explained that his Ponzi scheme, run through an account held by his investment-advisory business at the Chase Manhattan Bank, began during a “recession” in the early 1990s. He believed he would be able to extricate himself and his clients from the scheme with time  but couldn’t. But while admitting that the investment-advisory half of his company was fraudulent, he insisted that the proprietary-trading and market-making divisions  as well as the company’s London operations  were legitimate. 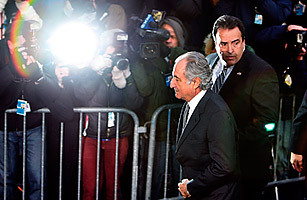 Observers suggested that this was a sign that Madoff was maneuvering to avoid charges against the rest of his family, noting that none of the 11 counts he admitted to  including fraud, perjury and theft from an employee-benefit fund  involved conspiracy. After Madoff’s guilty plea, Judge Chin, citing flight risk, denied bail, sending Madoff to jail immediately. The charges against him could result in a sentence of up to 150 years in prison. He will face sentencing June 16. The scene outside the proceedings took on a circus atmosphere. Apart from victims dispensing quotes , an array of New York City characters paraded by to promote their particular causes and enterprises. A drag queen and a court jester from the Imperial Court of New York carried signs advertising a “Night of a Thousand Gowns.” They went practically unnoticed as hundreds of reporters, both print and television, chased after anyone who could provide a sound bite on Bernie Madoff.